Answering Muslims: CAIR Changing the Subject to . . . Anders Breivik??? 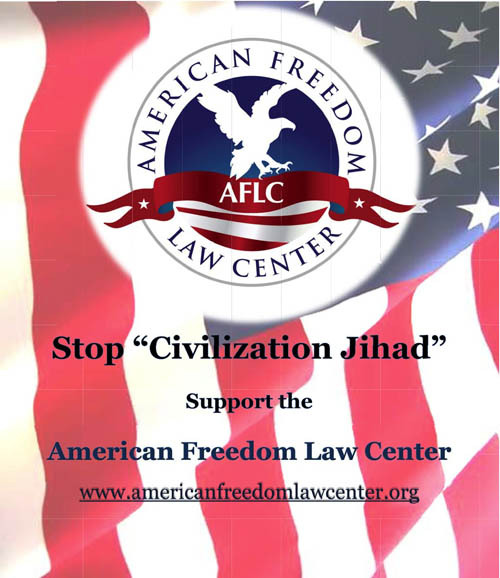 CAIR Changing the Subject to . . . Anders Breivik??? So there you have it. CAIR attempts to offset nearly 25,000 Islamic terrorist attacks by pointing to a "Christian" who admits that he isn't a Christian and who learned terrorism from Muslims. 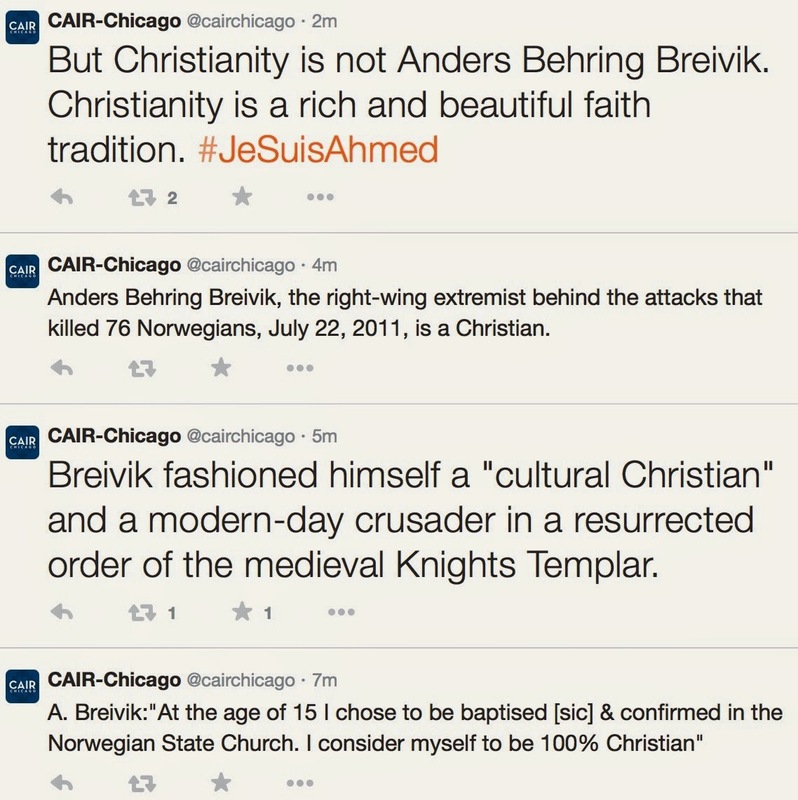 Notice that CAIR just specifically called Breivik a Christian. Remember this the next time CAIR tells us not to call Muslim terrorists "Muslims"! Indeed, Muslims who do not support such wicked actions as the murder of the people at the Paris magazine owe no one an apology for it. But I'll tell you who does: Islam's "prophet" Muhammad who gave the terrorists their example and their marching orders. He and his demon-idol, Allah, will have much to answer for at the Judgement. Thanks David. As usual an insightful tell-it-as-it-is video. It is abhorrent that while people lay dead and families grieve these tragedies are used to fuel counter-arguments that are virtually meaningless in content, but take us completely out of context! This somewhat childish deflective response ("but what about...? 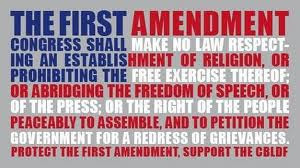 ")from the media and anti-Christian groups seems to be the go-to tactic of the 21st century. As their previous lines of argument are becoming increasing thin and unsustainable, and horrific statistics are mounting up higher and higher, we will no doubt see more and more efforts made to shift focus and change the agenda. In the quiet places within themselves I would hope that any vaguely intelligent person, regardless of their personal beliefs, would realize that arguments of this comparative kind smack of desperation (ask any parent). If we cannot defend our actions except by comparing them to another's, it is very likely because our actions are indefensible! People must learn to give an answer for what is happening without continually referencing someone else's behaviour. This is what is called behaving like an adult. Thanks for the video and for being a voice of reason. Your efforts to bring clarity and truth are very much appreciated! This is just a red herring. Instead of condolences, they give excuses. Instead of saying they are not Muslims, they try and justify these murderers. What a shame! Of course Muslims don't have to apologize: I like how Ali A. Rizvi put it, "Peaceful Muslims (majority) shouldn't have to apologize for the violent minority that actually takes the Quran seriously." About Ahmed, the dead cop, the Koran in 5:51 says "O ye who believe! Take not the Jews and the Christians for friends. They are friends one to another. He among you who taketh them for friends is (one) of them. Lo! Allah guideth not wrongdoing folk." So, he was also an infidel (or worse, an apostate) and thus a legitimate target. Just thought of this, by making the false accusation that Andres was a Christian and then comparing him to the dead Jihadi's, isn't CAIR admitting that the three Terrorists where Muslims? 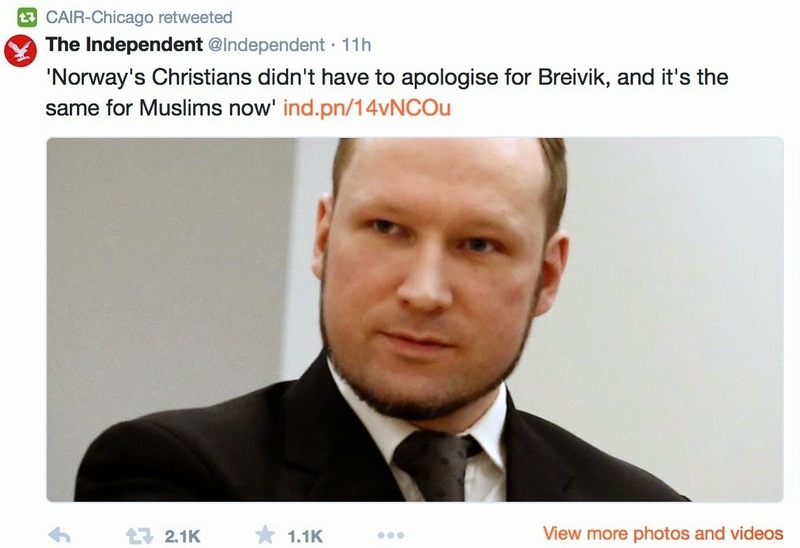 Let's pretend for a moment that Breivik really does consider himself a Christian. If that's the case, then he committed mass murder IN SPITE OF his faith. But when Muslims murder those they consider to be infidels, they do it BECAUSE of their faith. Huge difference. @Cranky. Exactly. I've been debating with people in facebook who claim Hitler was a Chrisitan. [DW]"CAIR attempts to offset nearly 25,000 Islamic terrorist attacks by pointing to a 'Christian' who admits that he isn't a Christian and who learned terrorism from Muslims." 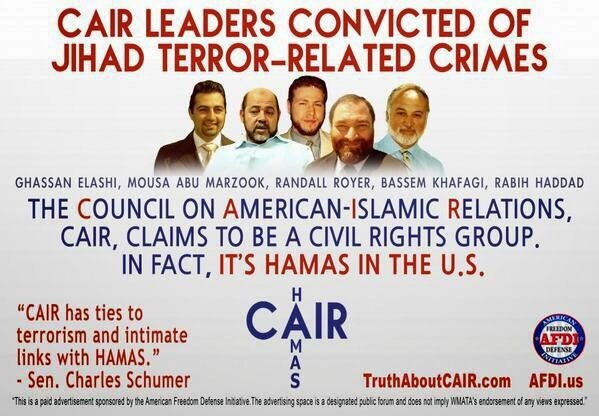 Perhaps CAIR could supplement its "attempts to offset nearly 25,000 Islamic terrorist attacks by pointing to" Hitler, who on occasion publicly claimed to be a Christian, and who practiced terrorism. [Foolster41]"I've been debating with people in facebook who claim Hitler was a Chrisitan." What are some of your claims? What are some of the claims of those debating with you? [Cranky White Woman]"when Muslims murder those they consider to be infidels, they do it BECAUSE of their faith"
You're making a moral judgment. One person's "murder" is another person's "justified killing." When Nazis went on killing sprees of those they considered 'inferior,' their killing sprees flowed out of their Nazi faith. When Communists went on killing sprees of those they considered 'enemies of the people,' their killing sprees flowed out of their Communist faith. When Muslims go on killing sprees of those they consider 'infidels,' their killing sprees flow out of their Muslim faith. * humans the Nazis considered to have 'inferior blood'? * humans the Communists considered to be 'enemies of the people'? * humans that Muslims doing mass killings in 2014-2015 considered to be 'infidels'? If you did say 'that was immoral,' what's the basis/rationale for your judgment? I don't quite get your point. You tell CWW that she's making a moral judgement (and is that a bad thing?). Then what you says doesn't really contradict what CWW said (i.e. Hitler's killing did contradict any supposed faith in Christ). The person claimed that most Christians voted for Hitler "He promised a moral Germany, with prayer and biblical sexual standards. Sound familiar?" I pointed out he is reported as saying he hated Christianity (which another person called "desperate", and that what he did contradicted Christianity. I also pointed out the claim would be just as nonsensical as calling a murdering beef-eating Buddhist a devout Buddhist and using that to reflect poorly on Buddhism. David, thank you for your information and your website. Anders Breivik was not a Christian. Maybe he was a failed Christian. If you hate your neighbor rather than love them, you are sinning. If you murder, you are sinning. He may believe in Jesus as a person, but he doesn't follow what Jesus taught. He is in hell, as is anyone of any faith who kills in God's name or not in God's name. God is not a God of wrath He is a God with Love for all His children and if any of these children act in disharmony (sin) with Him and His laws then there is a price to be paid for it. Anders Breivik is suffering now and so are the Islamist murderers who were killed by the police in France. We need to remember that anyone can claim that they are of this faith or of that faith but this doesn't mean that the faith is actually being observed. As usual, there is a fog settling over the hearts and minds of many people as more articles are published that in summary say "Islam is not to blame!". Words are used interchangeably in the media so that any question on the ideology behind Islam amounts to racist attacks on innocent Muslims. "Islamaphobia" is the new catch word, despite phobia referring to an unrational, non-evidenced based fear. There is more verbal effort being put into protecting the reputation of Islam, than being put into answering people's rational fears. Why is that so? It would be wrong to take this denial of the truth at face value. As Christians we need to look under the covers and ask "why are people so eager to defend Islam when there is open hunting season on other faiths all year round?" I don't pretend to know all the answers to this question, but I suspect that fear has a lot to do with it. 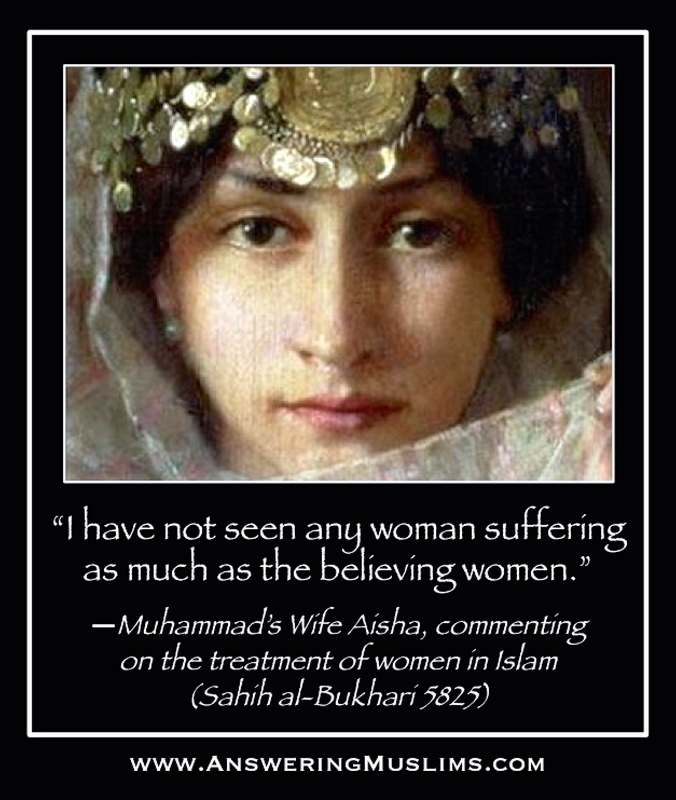 This is after all Islam's foundation. It is not a religion of peaceful inquiry as many assert, but a religion of forceful assertion where dissenters can be murdered and the murderers not only exonerated but rewarded. Islamic historians will tell you that Mohamad brought order to the supposedly (emphasis on supposedly) disorganized and debauched Arabic communities, (just like the Taliban, at first, brought order to Afghanistan). Whether this is true or not, that order has always and ultimately been maintained through fear of consequences. The ruthless murder of people who spoke disparagingly of Mohamad during his lifetime (including a respected widow and a young wife) was a form of psychological terrorism that achieved a similar response to what we're seeing today. We need not to be surprised therefore that many are avoiding the truth. In these last few days, we have seen in Nigeria, Germany and France what happens to those who object to Islam's position on freedom of speech and education alone. "This is not Islam" the world is being told, but strangely we are not responding "Then what IS Islam?". Rather than a demand for clarification, there is a strange and awkward silence when the words Islam and Muslim are now mentioned. Perhaps the same silence that people heard in Medina many centuries ago when Mohamad or his followers came near. Like them, we know what happens to those who object. Considering all this, it is worth considering that those most afraid to speak up, may indeed be Muslim themselves. I do not mean from fear of reprisals from the Non-Muslim world, but fear of their own. I know of two well-respected Western Muslims who simply believe that Muslims must give an account of their faith and be more open to receiving criticism and welcoming dissent. Each of these people receives death threats regularly, not from overseas agencies from both their own communities in democratic countries. Is it possible then, that the people who may need our prayers and compassion the most are those whose ideology forbids them to ask us for help? After Breiviks atrocity his manifesto was brutally scrutinized. Rightly so. The content of the manifesto could be downloaded and was discussed in media for months afterwards. Will we see the same scrutiny of the "manifesto" of these thugs? Will anyone on CNN dare to discuss and study their scriptures in depth on TV?